Will there one day be “no spot of English ground left, on which it shall be possible to stand, without a definite and calculable chance of being blown off it, at any moment, into small pieces”? Despite all the industrial devastation we have seen since – much of it, of course, outsourced to other parts of the world – this specific warning still sounds like an exaggeration. However, a century and a half later England is facing a threat on that sort of scale. 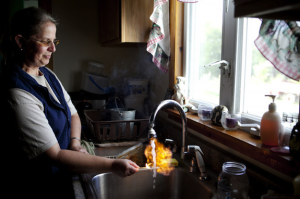 Explosions, earthquakes, poisoned air, chemical pollution and tap water that bursts into flames – these are all side-effects of fracking, the nightmarish form of gas extraction being imposed on this country. The scale of what is likely to be unleashed doesn’t seem to have percolated through to the general public yet. It’s not just a well here and there across the countryside we’re talking about, but a saturation level of environmental exploitation. Campaign group Frack Off reports that in Balcombe, West Sussex “at a spacing of 4 wells per square mile, full scale development could mean 32 wells within the parish and over 300 within 5 miles of the village. Cuadrilla have produced no estimates, but at a spacing of 4 wells per square mile development could mean up to 1,200 wells in Cuadrilla’s licence blocks in Sussex. Possibly more for shale gas development. A vast network of pipelines, compressor stations and processing plants would be needed to support such a development”. And they add that another fracking firm, Celtique Energy, “have been bragging extensively about the shale oil and gas they hope to be able to extract. The volume of oil and gas they are promising to shareholders would require over 6,000 shale gas wells and 800 shale oil wells in West Sussex”. And that’s just one corner. 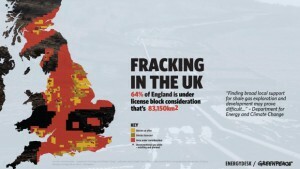 A staggering 64% of England is considered suitable for fracking. Imagine the scale of extraction proposed for a few small areas of West Sussex, but replicated across the country! Take a look of aerial photos of parts of the USA or Australia where the frackers have been at work (see top image). That’s what England could be reduced to in a few decades’ time. And how about those of us who live here? Maybe our homes will have collapsed in a fracking-induced earthquake like the ones in Blackpool. Maybe we will be suffering from early-onset dementia caused by the poisoning of our air or our drinking water. Maybe we’ll even have been burnt to death after the water from our taps caught fire. Nothing is too outlandish to come true in the fracked-up world of shale energy. The whole thing goes a lot further than this, of course. Think of all the tankers and works traffic constantly using these thousands of sites. Think of the new access roads that will have to be built over our countryside, all the rest of the infrastructure. And when we’re always being encouraged to save water, how are the millions of gallons needed for fracking going to suddenly become available for the industry to poison and squander? The threat of fracking is clearly so huge and so horrific that a massive uprising of pubic anger and opposition is needed to defeat it. Various attempts are underway. But the trouble is that, as ever, opponents are not just up against a few energy companies pushing specific projects. They are up against the whole of the corporate system, the global capitalist system, which is promoting fracking and hell-bent on imposing it on England and anywhere else they can. The links between the fracking industry and the government (or, if you prefer, between capitalism and the state which it uses to enforce and legitimise its monopoly of wealth) are not even very well hidden. Lord Browne, a director of fracking firm Cuadrilla, was appointed to the Cabinet Office in June 2010 by Francis Maude, who happens to be MP for Cuadrilla’s first Sussex fracking-target, Balcombe. Fracking is specifically supported by the G8 group of “world leaders” and was rumoured to have been on the agenda at the secretive Bilderberg meeting in the UK earlier this summer. The latest update is that Chancellor George Osborne is handing out a 50% tax break to the fracking industry, despite so-called “austerity”. This official pro-fracking line (which does not stem in any way from the “democracy” in which we are always told we are lucky to be basking) has been reflected in a series of pro-fracking stories planted in the press, with arch-capitalist and climate change denier Lord Lawson warning solemnly of the dangers of being “held to ransom by green fanaticism”. As Britain’s most-read newspaper (and draw your own conclusions as to what that says about this country and its residents), it was clearly important that The Sun was involved and it has been spewing forth a seemingly endless deluge of pro-fracking propaganda, full of talk of a “fracking goldmine” which offers the “hope of solving future energy problems and giving a £4billion-a-year boost to the economy”. Combining its pro-fracking stance with its anti-EU one, The Sun also accused the European Parliament’s environment committee of trying to “strangle shale gas exploration with red tape”. It’s unlikely that the capitalist system will stop at media mind-manipulation to force through fracking. No doubt even now, special units of political police are being set up to infiltrate, monitor, control, undermine and destroy the opposition to fracking. If the bribes don’t work and resistance steps up to the level of direct action, the Mail’s “green zealots” will become “eco-terrorists” and new laws will have to passed to put down the revolt. This is the reality faced by all “single-issue” campaigns, such as that against fracking – ultimately it’s the whole system you’re up against. That’s obviously why so many people who start fighting one particular threat to our lives and happiness end up with a wider perspective that enables them to see the bigger picture. The bigger picture here is that the capitalist-industrialist system will never voluntarily give up destroying the planet for its own gain and ruthlessly using all its considerable power to ensure nobody gets in its way. The bigger picture is that in fighting fracking, or road-building, or new airports, or nuclear power, we are fighting the system. And the biggest picture is that we can’t permanently win any of those battles until we have confronted the monster itself, until we have stood up together and said there is more that we value than its obscene obsession with profit, its deadly addiction to “growth” and its poisonous path of “progress”. Only once we have driven a stake through the heart of this planetary parasite can we recover the life and the future that it has so cruelly stolen from us all. 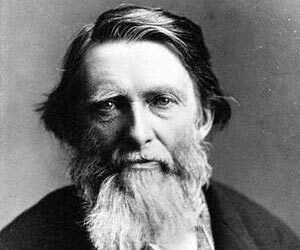 * There’s a longer section of Ruskin’s speech in The Anarchist Revelation.